An important part of any fantasy baseball league that only has weekly lineup changes is knowing the intricacies of the major league schedule. From the pitching side of things, you can gain a significant edge by rolling with pitchers who will start twice in a given week. In this column, will provide a weekly breakdown of some of the notable two-start pitchers to make sure that you are prepared for what lies ahead. Kluber has been busy since he’s already made two starts and has two more on tap for Week 3. He started off strong against the Twins, but his second start against the White Six was ugly as he allowed six runs (four earned) across 3 1/3 innings. Maybe just as rare as the eight hits that he gave up in that game was the three walks that he issued. He had a four percent walk rate last year, so don’t read too much into one bad outing. With two starts against bad lineups on tap, Kluber could be a difference maker for those who were lucky enough to draft him. Marquez was one of the more pleasant pitching surprises in all of baseball last year. He became a force for the Rockies, recording a 28.2 percent strikeout rate on his way to a 3.10 xFIP and 1.20 WHIP. The question entering this season was, can he duplicate such a strong campaign with half of his starts potentially coming in Coors Field? The Rockies certainly don’t seem worried since they just locked him into a long-term extension. He’s also come out of the gate strong, allowing one run and recording 14 strikeouts across 13 innings. Facing the Braves in Coors Field is no easy task, but his second matchup against the Giants is about as good as it gets. Even if the Braves give him some trouble, Marquez still has plenty of upside this week. 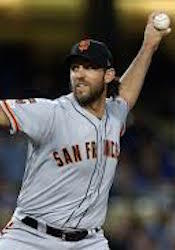 There was some concern surrounding Bumgarner during draft season. Injuries have plagued him the last couple of years and his average fastball velocity has gone from 93 mph in 2015 down to 91.4 mph last year. His swinging strike rate last year was only 9.2 percent, which was his lowest mark since 2012. His first start of the season couldn’t have gone much better as he held the Padres to two runs across seven innings while generating nine strikeouts. He didn’t fare as well by giving up five runs his following start against the Dodgers, but none of them were earned. He’ll face the Padres again in his first start of the week, setting him up with the possibility to get off on the right foot. He also dodges a bullet with his game against the Rockies being at home. The Rockies aren’t nearly as dangerous on the road, so it’s not all that surprising that they have only scored 17 runs this season since all seven of their games have been played away from Coors Field. Despite any concerns you may have had about Bumgarner when you drafted him, this is a week to make sure he’s locked into your starting lineup. There’s always been a lot of hype around Rodon, but he’s largely been unable to live up to expectations. Injuries have played a part, but so has his inability to keep runners off base. He has a 1.36 WHIP for his career, some of which can be attributed to his 9.8 percent walk rate. His 17.6 percent strikeout rate last year was a bit abnormal considering the 22.4 percent mark that he’s posted for his career, so the hope is that with a healthy offseason under his belt, he can return to being a viable fantasy option. As far as early returns go, it doesn’t get much better since he’s allowed four runs (two earned) while striking out 15 batters across 11 1/3 innings. It should be noted that he faced two horrible offenses in the Royals and Indians. With that being said, he has two more favorable matchups this week. The Rays have only scored 22 runs over seven games and the Yankees lineup has been ravaged by injuries. He’s a viable starting option. At just 28 years old, Teheran has already been in the league since 2011. After he became a full-time member of the starting rotation in 2013, he went on to make the All-Star team in 2014 and 2016. However, his production has fallen off of late, leaving him to record a 4.96 xFIP and a 4.72 xFIP in the last two seasons, respectively. His walk rate spiked to 11.6 percent last year, so his 1.17 WHIP could have been much worse if it were not for his .217 opponents BABIP. To put into perspective just how low that was, Teheran has allowed a .269 BABIP for his career. He’ll start off with a tough matchup at Coors Field, followed by a home game against a much-improved Mets lineup that now boasts the likes of Robinson Cano, Wilson Ramos and Pete Alonso. There will be weeks when Teheran is a viable streaming option, but this isn’t one of them.